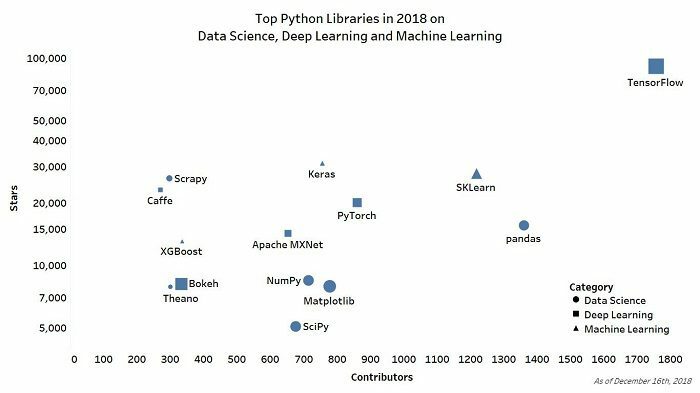 We recently published a series of articles looking at the top Python libraries, across Data science, Deep Learning and Machine Learning. As the year draws to a close, we thought we’d give you a special Christmas gift, and collate these into a KDnuggets official top Python libraries in 2018. As always, we want your opinions! So, if you think we’ve unfairly left any out, or if you disagree with any of our choices, please let us know in the comments section below. Fig. 1: Top Python Libraries, by GitHub Stars and Contributors. Shape size is proportional to number of commits.